A few thoughts on the Week 6 game between the Baltimore Ravens and the Minnesota Vikings, both from an on-field perspective and a fantasy football perspective. The Vikings survived a last-second field goal attempt to win a 33-31 barnburner. *Vikings QB Brett Favre got off to a hot start, but after the first two drives he started to come back to earth. Favre still throws hard, but his receivers helped him out with some nice catches of balls that were a tad off target. He wasn’t always 100 percent sharp, but he was plenty good enough for the Vikings to win. If Favre continues to play like this, the Vikings are going to be tough to beat, because the rest of their team is stout. *One thing helping Favre is his underrated group of receivers. Sidney Rice is emerging as a dependable threat, and Bernard Berrian and Percy Harvin both bringspeed and surprising toughness. And TE Visanthe Shiancoe is a terrific middle of the field target. Minnesota’s receiving corps doesn’t get a lot of props, but it’s better than you think. *Meanwhile, Ravens QB Joe Flacco lacks that kind of threats. The fact that RB Ray Rice was the team’s leading receiver entering the game says it all. Derrick Mason is generally dependable, although he offers few breakaway opportunities. The rest of the receiving group is pedestrian. That’s going to hold the Ravens back in games like this one when they’re trying to play from behind. *While the Ravens showed vulnerability on defense, I liked the offense’s persistence throughout the game. Even though they were down early, they fought back and made a game of it. That heart makes the Ravens dangerous despite their shortcomings. *Rice is a emerging young player, but Flacco needs to fight his propensity to check down to him is a little too much of a security blanket right now. Rice had six first-half catches, including a line-of-scrimmage check-down on the final offensive snap of the half on a play that Flacco should have thrown into the end zone on. That’s the kind of thing Flacco will learn to do as he becomes more secure in what he can and can’t do. I’m all for using Rice as a weapon, as on his long fourth-quarter catch and run, but the Ravens can’t rely on him to move the offense as a check-down option. *The Ravens’ defense gets a lot of pub, but it showed some softeness in the secondary, especially early. The best defensive player I saw was Terrell Suggs, who is a great pass rusher but a good player all over the field. He’s as complete a player as a 3-4 outside linebacker can be. * The Vikings’ defensive line is stout. Jared Allen gets all the attention, but Kevin Williams blows stuff up inside on a regular basis, and Ray Edwards and Pat Williams are assets as well. That’s as good a group of four as there is in the league. Allen made some plays against Ravens rookie OLT Michael Oher, although Oher wasn’t completely embarrassed the way Green Bay’s Daryn Colledge was against Allen. *You have to wonder, after Steven Hauschka missed a 44-yard field goal that would have won the game, if the Ravens wish they had given stalwart kicker Matt Stover (now with the Colts) another year. That miss was a killer. *Adrian Peterson is really, really good. ‘Nuff said. Even against a good defense, you see his talent pop off the screen, and he unquestionably is a No. 1 fantasy back. 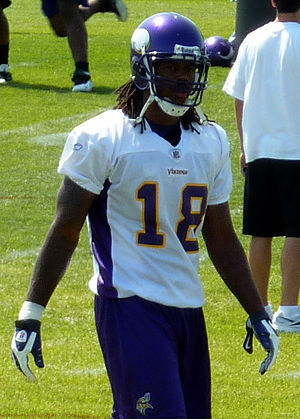 *Sidney Rice is going to emerge as the Vikings’ No. 1 receiver by the end of the season. He’s the guy Favre seems to look to most often, and his size allows him to sit down in zones, while he has excellent hands. Rice may never be a 12-TD receiver, but he can develop into an 80-catch guy, and he can break a big play from time to time, as he showed twice in the second half. Rice should be at least a No. 3 fantasy receiver in larger leagues over the rest of the season. *Bernard Berrian, meanwhile, has a relatively minor role in the offense, especially given his contract. He did catch a first-quarter touchdown, but he was wide open on that play, which definitely helped. He’s more of a No. 4 fantasy wideout. But his big-play ability, which he showed by drawing a long pass-interference penalty in the fourth quarter, is still an asset to the Vikings and gives him fantasy value as a fill-in. *Percy Harvin, meanwhile, is faster and tougher than you would think. He’s still learning to be a receiver, but he has a surprising amount of polish for a rookie. He’s a borderline No. 3 fantasy receiver right now who will be much better next year. *Visanthe Shiancoe is a top-10 fantasy tight end. His seven-TD season in ’08 looked like a fluke, given his past performance, but he’s following up on it in 2009. He caught his fourth and fifth TDs of the year and had several other nice grabs. He’s a big, rangy target who should be a good receiver – it just took him a while to develop. But now, he’s should be an every-week starter at tight end. *Willis McGahee is probably the biggest fantasy anomaly of the season thus far. He has seven TDs but his role in the offense doesn’t support that kind of production. So don’t fall victim to his numbers and consider McGahee anything more than a No. 3 fantasy back. Meanwhile, Ray Rice is getting the lion’s share of the carries and he’s developing into a huge threat. This was a breakout fantasy game for Rice, who had two rushing touchdowns and 194 total yards from scrimmage. All of us now need to recognize that Rice is an every-week fantasy starter no matter who the Ravens are playing. *Derrick Mason is the only Ravens’ wideout you want on a fantasy team. Mark Clayton and Kelley Washington don’t get enough looks, even though Clayton did have a touchdown catch in the fourth quarter, and TE Todd Heap had to stay in and block often enough that it will hamper his fantasy value. With OT Jared Gaither hurt, that trend for Heap could continue. *While Joe Flacco doesn’t have one great target, he moves the ball around enough that he can still be hugely productive. His 385-yard, two-touchdown performance is the kind of thing he has done all season. He’s now a top-12 fantasy quarterback. Likewise, Favre is a top-12 fantasy quarterback. He had 278 yards and three TD passes in this game.